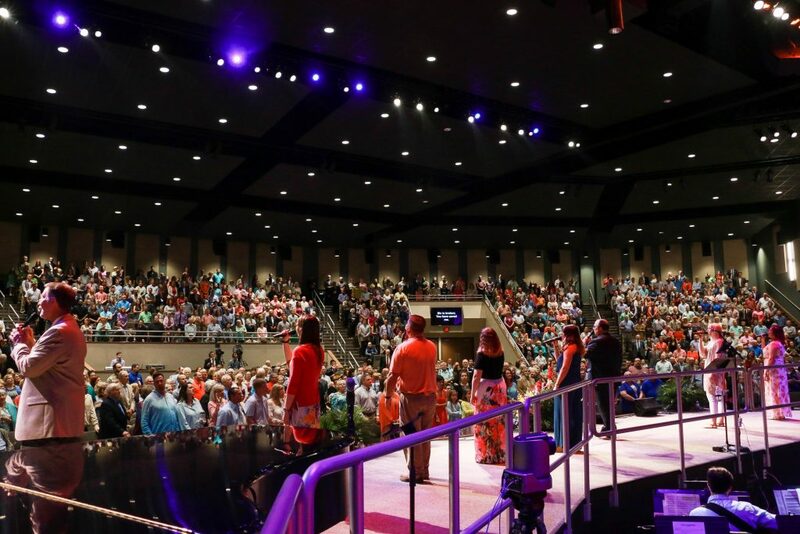 LUBBOCK, TX, – Southcrest Baptist Church holds five weekly services, three of which involve a full choir and orchestra. The church also offers seven weekly television broadcast programs that reach a local and worldwide audience. Along with its weekly services, the church hosts an Internet live stream three times a week. Rusty Trowbridge, technical director/lead audio technician at Southcrest Baptist Church, wanted to improve the overall sound quality for the prominent Northwest Texas church’s weekly services and broadcasts. After testing various options, Trowbridge found that a selection of DPA microphones produced the best sound and were able to handle the church’s high-production demands. The upgraded microphone package Trowbridge employed consisted of DPA d:vote™ 4099 Instrument Microphones for most of the orchestra, including all of the stringed instruments (violin, viola, cello, double bass and harp), 12 DPA d:sign™ 4098 Supercardioid Ceiling Microphones hanging from the ceiling for the choir and a d:fine™ 4166 Flex Omnidirectional Headset Microphone for the church’s senior pastor. DPA has recently released a new, upgraded instrument microphone, the d:vote CORE 4099 Instrument Microphone. The CORE version adds another layer of sound quality. The CORE by DPA amplifier is a powerful new technology that brings more clarity and details to music across the entire dynamic range. DPA Microphones is the leading Danish Professional Audio manufacturer of high-quality condenser microphone solutions for professional applications. DPA’s ultimate goal is to always provide its customers with the absolute finest possible microphone solutions for all its markets, which include live sound, installation, recording, theatre and broadcast. When it comes to the design process, DPA takes no shortcuts. Nor does the company compromise on its manufacturing process, which is done at the DPA factory in Denmark. As a result, DPA’s products are globally praised for their exceptional clarity and transparency, unparalleled specifications, supreme reliability and, above all, pure, uncolored and undistorted sound. For more information, please visit www.dpamicrophones.com.